Glad I didn’t pull the trigger on this one! 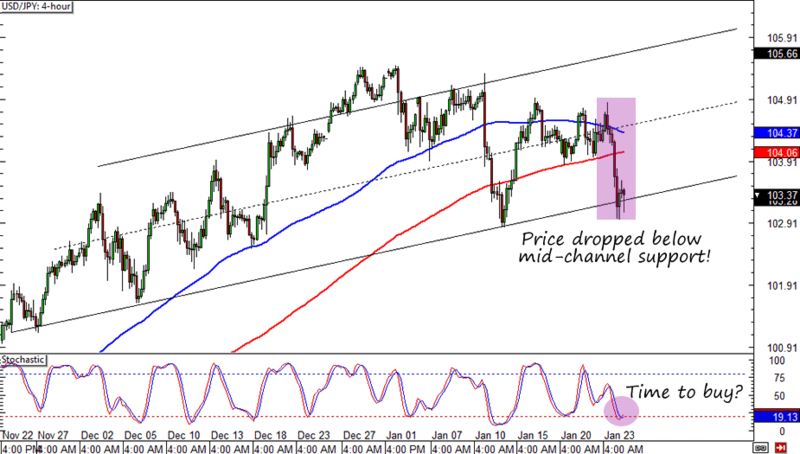 Last week I was thinking of buying USD/JPY on a Fib and mid-channel support. I held back from pulling the trigger because I also saw a potential falling trend line on the lower time frames. In addition, the SMAs weren’t supporting my “trend” trade at the time and I promised in my Q4 2013 trade review that I wouldn’t go against my SMAs! Last but not the least, I was seeing that traders weren’t as excited for the dollar as they were in December. Fundamentally I still believe that the dollar is in for more gains. I guess it’s just a matter of timing. But hey, it looks like USD/JPY is now testing the BOTTOM of the rising channel. What do you think? Is it time to buy?